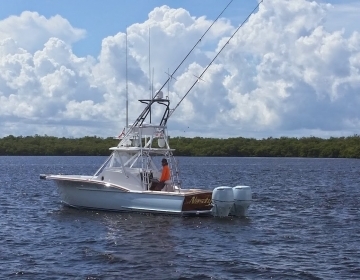 Hi,what is the asking price of this boat,engine hours,tackle station/leaning post? Thanks for your inquiry Joe, you should have received a response from a sales representative via email. Please let us know if you have any further questions! Can you send me some some pricing on this 32′. Thanks for your inquiry John, we’ll be in touch with you directly via email. It should be noted we have two different approaches in this size range, this boat your looking at was a fully custom cold-molded boat, but we also have the all fiberglass 34 “semi-production” line as well. Hello, I was wondering if I also could get the pricing on the 32′. Absolutely, we’ll be sending you some more info directly via email. Thank you for your interest! Can I get some pricing info? Thank you for your interest in Jarrett Bay, you should have received more information via email – please let us know if there is anything else we can answer for you! Send me the pricing info and others, want one! Can I get some pricing info for the fully customized fisharound cold molded 32 with full upper station?Thank you. Hello Mr. Klons, Thank you for your interest! Tate will be in touch with you directly via email to answer your pricing questions on the 32 WA. Have a great day! sure thing, we’ll respond with more information via email – thanks for your interest!